What is 50 Book Challenge? 50 Book Challenge is a way to track and share the books you read throughout the year. Some people also choose to set personal goals to read more books, or more non-fiction, or more new books. The point is that it's up to you what you want to do. Do I have to read 50 books? What if I read less/more/long books/etc? Can I include kids' books/comic books/picture books/etc? 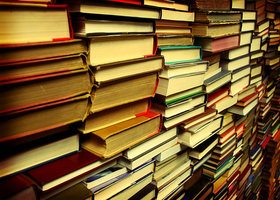 Read as few or as many books as you want - 50 is just a suggestion. Some people also track the number of pages they read, particularly if they're reading a lot of longer books this year. One way of finding a number of pages for the challenge is to multiply the number of (shorter) books you might have read by 300 (e.g. 50 x 300 = 15,000 pages). You can include (or exclude) any types of books you want (including but not limited to rereads, graphic novels, comic books, audiobooks, and kids' books). Same goes for including reviews, ratings, or summaries, tagging your books, and using a progress meter (such as this or this) - do it if you want to, don't do it if you don't. This sounds like fun! How do I start? To begin, click "Post a new topic". Include your LibraryThing username in the subject, then put your first book(s) in the message. Or your to-read list. Or make it a simple hello post, if you like. When you want to update - when you finish a book, or monthly, or every three books, whatever - just make a new post in your topic. Your Challenge year doesn't have to start January 1! If you don't remember everything you've read since the beginning of the year, you can start your year when you join and keep track until this time next year.